This research project looks at Squamish traditional plant medicines, traditional foods and culturally related exercise and explore how these things might aid in the prevention and management of type 2 diabetes (T2D) in our communities. The research team consists of a Squamish Nation committee working in cooperation with a research team out of the University of Montreal and the University of Ottawa. I (Leigh Joseph) will be undertaking my PhD studies through this project. The aim of the research is to contribute to the Squamish Nation community in the most practical and useful way possible. Therefore I will be looking for input and ideas throughout this research project and beyond. The Tahltan book project was a community based research project with the Tahltan First Nations communities in Telegraph Creek and Dease Lake, British Columbia. I worked closely with elders and knowledge holders in the community to identify priorities for documenting Indigenous Plant Knowledge and stories from these communities and producing a Tahltan ethnobotanical field guide for community use. The book titled "Tahltan Plant Foods and Medicines" opens with elders profiles and stories of their connections to plants and to the land. Then the book moves into an ethnobotanical field guide including cultural, botanical and ecological information about a number of culturally important plant species and recipes and other resources for the community to further their learning about Tahltan ethnobotany. 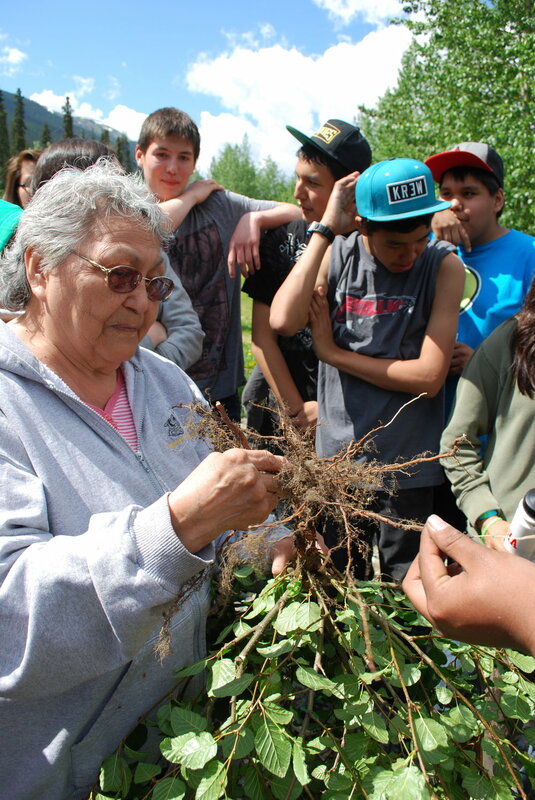 This research project also involved harvesting trips out on the land with elders and youth, classroom workshops and lessons focused on learning about Indigenous plant relationships in Tahltan Territory and involvement in the annual Tahltan Health Fair. Over the past two centuries Indigenous Peoples in North America have undergone a significant change in traditional diet, medicinal plant use and overall way of life due largely to colonial impacts. For many of our ancestors, good health, fitness and longevity were directly connected to their active lifestyles and traditional diets. Diseases related to changes in lifestyle are now of major concern in Indigenous communities and Type 2 Diabetes (T2D) is one of these diseases. Canadian Aboriginal peoples are among the highest risk populations for diabetes and related complications. Prevalence of diabetes is 3 to 5 times higher in Canadian Indigenous populations than in the general populations and more young Indigenous Peoples are being diagnosed with T2D. We are in a time, as Indigenous Peoples, where we are building a renewed sense of connection to the land and all that it offers to sustain us physically, spiritually and emotionally. The foods and medicines we harvest, prepare and utilize heal us on many different levels. In this time of Indigenous Knowledge renewal and healing we are looking to our ancestors for guidance as we move towards healing though connecting to our Traditional Knowledge. This research will examine the link between healing and the renewal of Traditional Ecological Knowledge and practices related to ethnobiology. Secondly, the research will explore ways that traditional foods and medicines, along with culturally relevant interventions, may prevent and manage Type 2 diabetes in two Canadian Indigenous communities. The two communities involved will be the Squamish First Nations in southern British Columbia and the Tr’ondëk Hwëch’in First Nations in the central Yukon.